The Submariner line is not only one of the best known in Rolex’s production, it also presents one of the most interesting evolutions - especially in its first years of production - which yielded some of the rarest and most collectible timepieces on the market. The present example is a very early version of reference 5512. Launched in 1959, the model was the first Submariner to feature crown guards, and it is distinguished by its chronometer-certified movement. The present early production piece from 1961 is particularly attractive as it reunites a multitude of unusual and sought-after traits, making it an extremely collectible piece. The black glossy dial presents a radium dot at 6 o’clock unmistakably identifying this as an “exclamation mark” dial - the name coming from the ensemble dot and index, which resembles an exclamation mark. Such dials were in production only during a short period of time between 1961 and 1962 and are one of the first attempts to identify a lower radiation count compared to earlier dials. In fact, the harmful effect of radiation was at that time in the process of being identified and regulated. Exclamation mark dials still feature radium - tritium will come immediately after - but in much lower amount than earlier specimens. The case also boasts a particularly collectible trait: the pointed crown guards (or “Cornino” – literally “small horn” in Italian). The genesis of this detail is extremely interesting. The very first crown-guard cases featured large square crown guards. When clients complained about the bulkiness of this feature, Rolex filed away the square crown guard of the cases they had in stock, leaving only a small pointed guard. Thus, the “Cornino” was born. Successive cases will be produced with the flat crown guard which became the standard for the reference. 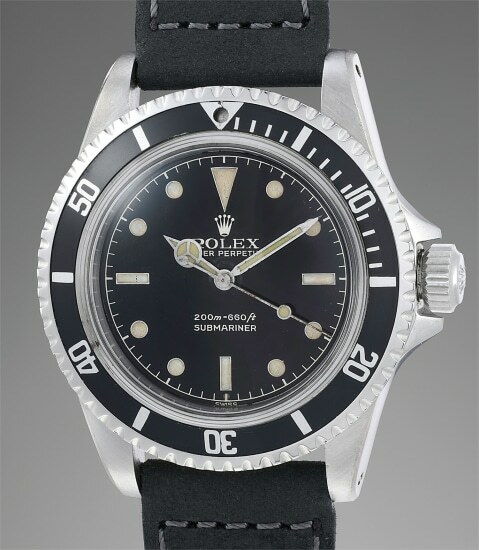 The black glossy exclamation mark dial, pointed crown guards and overall attractive condition make this timepiece a watch for the shrewd collector of rare Submariners.